I thought you might like this photo !!! This is me 16 months on from a partial conformis knee. 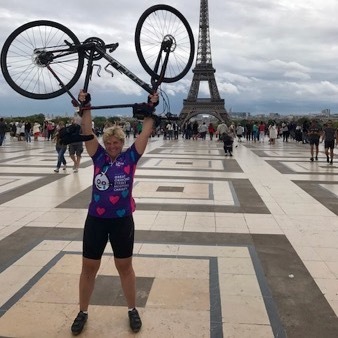 I completed a 455 km London to Paris charity ride for Great Ormond Street Hospital at the weekend !! The ride was over a four day period and not only did I complete it but I kept up with my 20 year old son and all the young lads at the front !!!! My knee didn’t hurt once!! I can never thank you enough for such an amazing knee !! Each time I am on my bike I think how lucky I am!